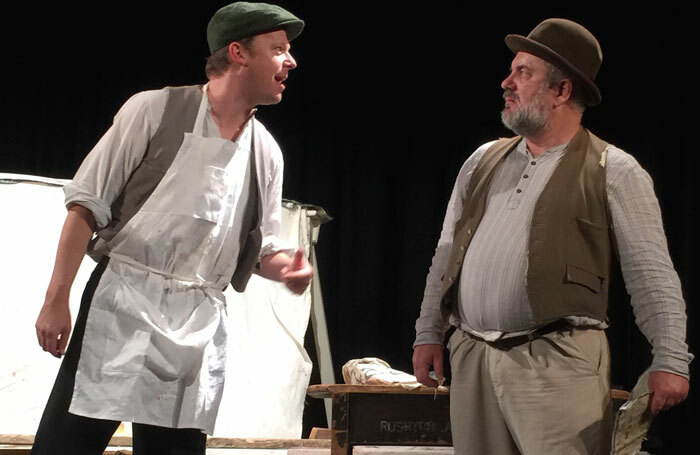 Compressing Robert Tressell’s sprawling socialist masterpiece on to the stage in the first place is quite a task; doing so with only two performers is an impressive achievement indeed. Tressell’s story of hardship and penury in the fictional east-coast town of Mugsborough is ably and imaginatively performed by Neil Gore and Jonathan Markwood, who divide up the populous cast (and in one case a single role) between them, and a mixture of music-hall songs and puppetry gives the entire piece a rough and ruddy-faced charm. Markwood is earnest and credible as painter and decorator Frank Owen, drawn towards socialism by his meagre wages, while Gore takes a raft of creepier characters, consistently keeping one step ahead of caricature. Director Louise Townsend wisely keeps the pace fast and the long lectures, one of the few weaknesses of Tressell’s book, to a minimum. Audience interaction is used sparingly but to great effect, with an Act I closer that perfectly embodies the novel’s spirit of plain-speaking and generosity. With the heady rush of Corbyn-fever barely out of the bloodstream, it feels a particularly timely staging of a fierce and uncompromising novel, a little ragged and shaggy around the edges but also heartfelt, hopeful and humane.